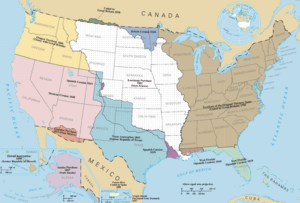 The Eastern United States, commonly referred to as the American East or simply the East, is a region roughly coinciding with the boundaries of the United States established in the 1783 Treaty of Paris, which bounded the new country to the west along the Mississippi River. It is geographically diverse, spanning the Northeast and Southeast as well as the eastern part of the Central United States. In 2011 the 26 states east of the Mississippi (including Washington, D.C. but not the small portions of Minnesota and Louisiana east of the river) had an estimated population of 179,948,346 or 58.28% of the total U.S. population of 308,745,358 (excluding Puerto Rico). Kentucky, Tennessee, Virginia, West Virginia, Maryland, North Carolina, South Carolina, Georgia, Arkansas, Alabama, Mississippi, Florida, and Louisiana are parts of the Eastern United States which make up the area often known as the Southern United States. The region consists of seven states in the central and inland northeastern US: Illinois, Indiana, Iowa, Michigan, Minnesota, Ohio, and Wisconsin. A 2006 Census Bureau estimate put the population at 66,217,736. Both the geographic center of the contiguous U.S. and the population center of the U.S. are in the Midwest. The United States Census Bureau divides this region into the East North Central States (essentially the Great Lakes States) and the West North Central States. Eastern United States Facts for Kids. Kiddle Encyclopedia.